Georg Friedrich Ferdinand, Prince of Prussia, head of the Imperial House of Hohenzollern and great-great-grandson of Wilhelm II, the last Kaiser of Germany, is selling a diamond that has been part of the crown jewels of France, Holland, England, Prussia and the German Empire. 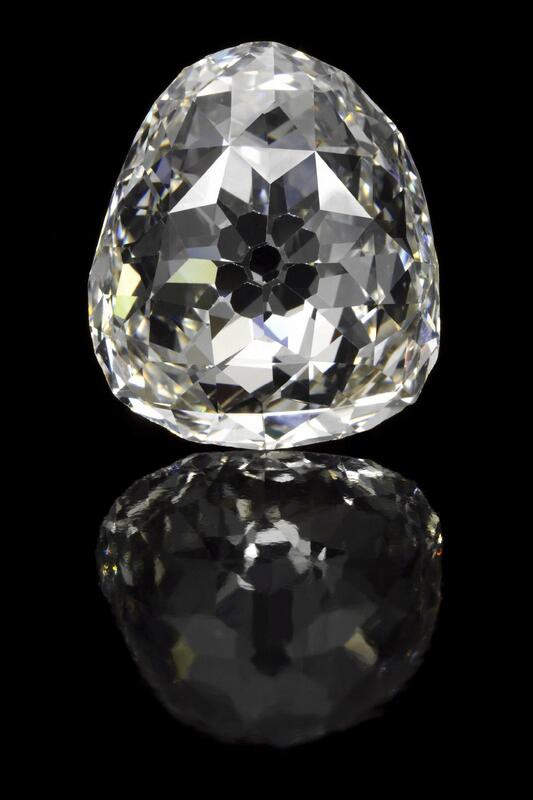 Known as the “Beau Sancy,” the 35-carat modified pear double rose cut diamond is thought to have been mined near the south-central Indian city of Golconda, the same mines that produced the Hope Diamond. It was purchased in 1570 in Constantinople by diplomat, financier and famed jewel expert Nicolas de Harlay, Lord of Sancy. Harlay also owned a 55.23-carat shield-shaped yellow diamond called the “Sancy” so the smaller, whiter gem came to be called the “Beau Sancy” or “Little Sancy” to distinguish it from its cousin. An avid monarchist, Harlay sold high-end gems to raise money for King Henry III of France’s wars. He loaned both Henry III and Henry IV the “Sancy” diamond. The former king borrowed it to wear on the cap he used to cover his baldness; the latter used it as collateral to finance yet another war. Harlay owned both spectacular stones for decades, entering into years of negotiations with potential buyers like the Duke of Mantua which went nowhere. He finally sold the “Sancy” to King James I of England around 1604. Legend has it that when Marie de’ Medici, wife of King Henry IV of France, found out that the biggest Sancy stone was now in the clutches of the English monarchy, she was so furious that Henry bought the “Beau Sancy” to appease her. He gave it to her as a gift. Marie had it set at the top of the crown she wore at her coronation on May 13, 1610. There’s a formal portrait of Marie in full coronation regalia by Frans Pourbus the Younger in the Louvre which depicts the “Beau Sancy” at the apex of her crown. Unfortunately for Marie, on May 14, 1610, her husband was assassinated. Marie was made regent for her eight-year-old son, Louis XIII, and was by all accounts awful at it. Louis had to claim his own throne by force in 1617 and exile his mom to French hinterlands. She kept intriguing against Louis’ rule and against his puppet master/advisor Cardinal Richelieu in various countries for the next 25 years. In 1641 she was in Amsterdam and deep in debt. 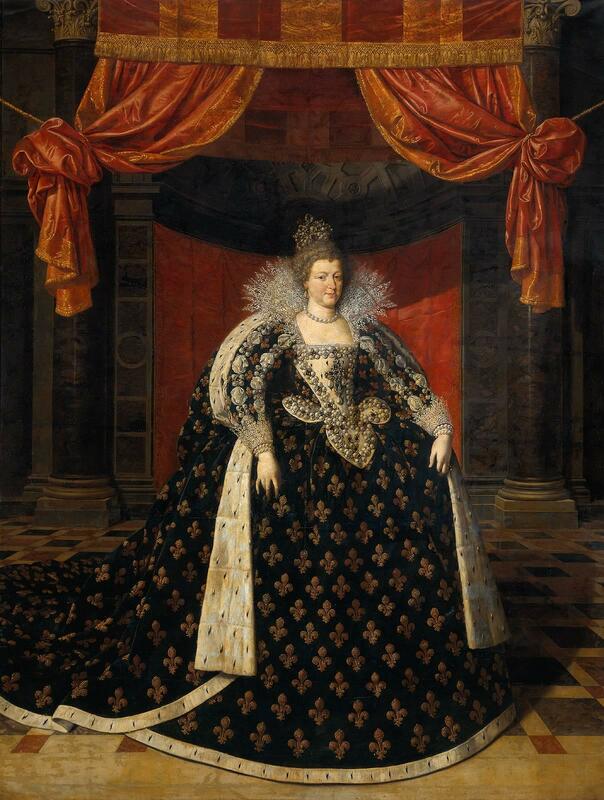 To pay off some of her creditors, Marie de’ Medici sold the “Beau Sancy” to Frederick Henry, Prince of Orange-Nassau, for a staggering 80,000 florins, the single largest expenditure in the state budget for that year. Prince Frederick Henry’s grandson William III of Orange inherited the stone. He gave it to his wife Mary as a wedding gift. After Catholic King James II of England was overthrown in the Glorious Revolution of 1688, the couple ascended the throne of England as King William III and Queen Mary II. They brought the “Beau Sancy” with them to England, and James II took the “Sancy” with him when he fled to France. Broke and dependent on his cousin King Louis XIV, James II sold the “Sancy” to Richelieu’s protégé Cardinal Mazarin who in turn left it to the Sun King in his will. The “Sancy” disappeared during the French Revolution but reappeared on the market in 1828, going through various hands until it was sold to the Louvre in 1978 by William Waldorf Astor, 4th Viscount Astor. Meanwhile, William and Mary died childless, so after their deaths the “Beau Sancy” went to another grandson of Prince Frederick Henry’s, Frederick III, Elector Prince of Brandenburg and as of 1701, King Frederick I of Prussia. The diamond was considered the most important stone in the crown jewels and was worn by every royal bride until the dissolution of the monarchy after World War I. When Kaiser Wilhelm II abdicated as German Emperor and King of Prussia and fled to the Netherlands in November 1918, the diamond stayed in Berlin. It was kept in a sealed crypt for safekeeping during World War II. British troops discovered the stone after the war and returned it to the House of Hohenzollern where it has remained ever since. On May 14, “Beau Sancy” will be put on the auction block at the Sotheby’s Geneva Magnificent Jewels and Noble Jewels sale. The diamond will tour the world before then, stopping at Sotheby’s showrooms in Hong Kong, New York, Rome, Paris, London and Zurich before arriving at its destination in Geneva. “Beau Sancy” has only been on public display four times over the past 50 years, so it’s a rare opportunity. Who knows where it will end up after it’s sold. Philipp Herzog von Württemberg, chairman of Sotheby’s Europe, expressed a hope that the French government would buy the stone so the two historic Sancy diamonds could be together again at the Louvre, but I suspect that’s a pipe dream. The pre-sale estimate is $2 million – $4 million. I suspect those numbers are a pipe dream too. This entry was posted on Friday, March 2nd, 2012 at 11:58 PM	and is filed under Modern(ish), Renaissance, Treasures. You can follow any responses to this entry through the RSS 2.0 feed. You can skip to the end and leave a response. Pinging is currently not allowed. $2-$4 million may be a lot of money for some of us, but there are also rap artists, wives of soccer players and Republican presidential candidates who are ready and willing to spring for a bit of historic bling. A mythic piece for sure! As far as jewels go, there is still the big question mark of the Medici Diamond, called “Il Fiorentino”–a nearly 140 carat yellow stone that was the most famous element of the Tuscan Crown Jewels. It went to Vienna after the end of Medici rule and then disappeared from the Hofburg (it is claimed) in the pocket of Otto von Habsburg (who died last July at age 98, taking the secret to the grave?) Most likely, it was broken up and sold off three-quarters of a century ago–but you never know! I dearly hope to blog about someone stumbling on “Il Fiorentino” still gloriously intact in an Austrian attic somewhere. Sadly, I have to agree. I’m expecting Russian billionaires to leave any institutions in the dust a few minutes into bidding. I do have to commend the photographer, that is a really nice picture. As you know liv, some auction house gem photos show fingerprints or even have the fingers themselves in the picture. Which is just heinous and disrespectful to the stone. I was pleasantly surprised that they had managed to take a good, clean picture of the stone. I totally thought of you when I scoured it for fingerprints. Hey there. Due our same interest in blogging I came by to promote my history blog! This isn’t a blog like yours though, it’s more a little update on people worth checking out :). Keep doing what you do though, this is informative stuff you got here! Ps, this isn’t a spambot or stuff. I’m actually typing this myself, trying to find new people to come over and comment :). Interesting post – just a small correction: Marie de Medici’s connection was to Cardinal Mazarin, not Richelieu! Marie de’ Medici was very much connected to Richelieu. He was a close confidant and her Secretary of State for a time. So close were they that when Louis XIII overthrew her to claim his throne, he had Richelieu banished too. He helped negotiate a truce between Marie and Louis, then sidled his way into Louis’ good graces eventually becoming his chief minister. When Marie almost got him fired, Richelieu got her banished. She plotted against him (unsuccessfully) the rest of her days. Richelieu and Marie died the same year, 1642, and Richelieu’s pupil Mazarin took over as Louis XIII’s chief minister. Trust me, that stone will go for well over $5 million , collectors such as Laurence Graff have paid over 20million on several occasions for a rare diamond. Auction houses give estimates on the intrinsic value of the stone, a brilliant provenance will usually double or treble the estimate. Just look at the recent Elizabeth Taylor auction some big ticket items sold for five times their estimate. In what year was the Florentine Diamond stolen? All I can find on the net is that it went missing around 1918, can’t lay the blame on Otto in that case as he would have only been around 6yrs old, more likely Emperor Charles or Empress Zita was the one with the sticky fingers. The jewels I’d really like to track down are the Byzantine Empiracal Crown jewels. They were pawned to the Ventiains to pay for a civil war by a certain “Queen.” Then not ever quite redeemed from them, when payment was due. They are “lost” when Napoleon sacked the city. But, contrary to his ego, he never claimed to have used any of them in his Imperial regalia… or to have even acquired them. So… where are they? One would hope the Venetians would have hidden them from Nappy but that now they would display them somehow, along with all the other stuff they looted from the Emprie. If this stone had been owned by the head of the former French royal family, and been kept in France for decades, no WAY the French gov. would permit its export, and being part of French patrimony. I’m betting it sells for a lot more than the $2 to $4 million estimate. Hopefully Graff won’t recut it if he buys it. I am afraid that I have to agree with you. There is a gentleman from one of the royal or super wealthy families in the Middle East that buys up large significant diamonds. It would not be a surprise if he bid on the Sancy and was successful. I am writing this on the 18th May, a few days after the actual auction. I still haven’t found any articles on the outcome of the Sotheby’s auction scheduled 15th May. I would appreciate it very much if you can write me any information about the SANCY auction. It sold for $9,699,618. I had a feeling it would go for at least $8 million — it has such a long history. According to Sotheby’s, before this auction it had always been owned by one royal house or another. Except for its first documented owner, that is. Harlay was a nobleman, but he wasn’t royalty. Great history.I just love it!